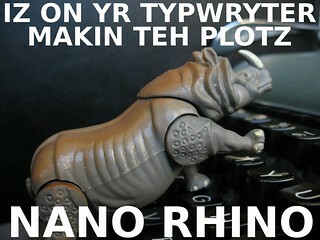 Welcome to the Typosphere: Campy Rhinos? Anyone out there in the 'sphere going to give Camp Nanowrimo a try this year? It's like regular NaNoWriMo, but held in June and August. I tried this last year, but had trouble working up the motivation to write every day during the peak of a California summer when the pool was so inviting. I could be convinced to "cheat" this year and spend a month rewriting and digitizing my 2011 draft. I appear to be crippled into inaction without a menacing deadline hanging over my head. Seems like this would be the perfect time of year for our Southern Hemisphere members to play along, too, as it's the depths of winter. Anyone? I could be convinced to slap a little sunblock on the Nano Rhino. He's been hiding on my desk since November, and might enjoy the chance to dance on the keys again. Pardon my ignorance (I'm a fairly recent and "green" member of the typosphere); but, what's this NaNoWriMo thing about? And how do you take part in it? NaNoWriMo is a worldwide project (contest?) to try to draft a 50,000 word novel in one month. Typically it's done in November, but the folks behind NaNo have branched out with the idea of a summer camp, and hold two other events in the summer. A number of us are overtaken by madness every November and try it, many typing the drafts on our trusty machines. We're the self-styled "Typewriter Brigade" and we're generally a bit more crazed than the rest, since we are basically setting ourselves up for twice the work: typing the draft, and then getting it into a computer somehow afterwards (usually after the month ends.) Here's a good primer on NaNoWriMo in general. What's really funny is that I stumbled upon NaNoWriMo by looking for photos of typewriters, and thought it would be worth trying. I think you have a great notion - they ought to have an editing/rewrite event, and June would be a good month for it. I think closing the circle would be great. Maybe I will try that with you. I'll be leaning on Camp NaNo to finish the novel I started last November. I had to give that one up because of the move to the new house but I've been running the plot in my head since...it needs to get out!! I'd be doing great if I even manage to do the regular NaNo contest coming up in November -- summers are actually more busy musically than the rest of the year for me, so I won't have time/energy for Camp NaNo, alas. But have a great time! You're an excellent writer. I will be playing the Midsummer Mozart festival in the bay area, staying at my friend's house in Lafayette (July 16 -29). Perhaps I can persuade you to take a break from Camp NaNo for another type-in? Summers are relatively down for me unless my boss gives me more hours. I might take advantage of the summer camp to finish my novel. I've had to tack on another 15 chapters and getting the motivation has been daunting. I don't know, we'll see. Maybe us who live in the California 94XXX area should get together and pester each other on our progress. Oh, good heavens. It's like they're inventing new months in which I can fail.